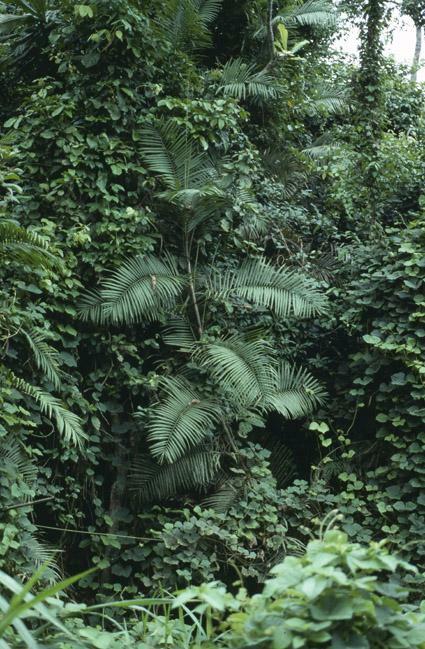 This species is accepted, and its native range is Senegal to Uganda and NW. Angola. Clustering, high-climbing, spiny palm to 20 m. or more in length. Stems branching sympodially at the base, without sheaths 7–30 mm. in diameter; internodes 8–20 cm. long. Leaf-sheaths very varied in armature from almost unarmed to densely spiny, with a marked knee below the petiole; spines black, flattened, up to 3 cm. long, occasionally seriate, interspersed with brown or grey indumentum; sometimes with clusters of upward pointing spines around the leaf-sheath mouth; ocrea present and usually conspicuous, dry, papyraceous, tongue-shaped, then splitting and becoming bilobed, to 12 cm. long, usually less, armed with spines, often paler and more bristle-like than those on the leaf-sheath or rarely unarmed. Leaves ecirrate, to 1.75 m. long, usually less, with petiole to 20 cm. ; petiole rounded abaxially, channelled adaxially, ± 5 mm. broad, variously armed with large black spines to 3 cm. long and small recurved black hooks; rachis triangular in section distally; leaflets ± concolorous, numerous, up to 30 on each side of the rachis, subequidistant to equidistant below, in most populations grouped in 3’s to 5’s distally, up to 35 cm. long by 2 cm. wide, widest about 1/3 distance from insertion, tapering to a long tip, the margins and main vein bristly throughout, somewhat plicate with up to 9 prominent secondary nerves, and prominent sinuous lateral veins. Flagellum to 2 m. long by 4 mm. wide at the base, decreasing very gradually above, armed with small recurved hooks. Male and ♀ inflorescences similar, to 2 m. long, with 1–4 partial inflorescences and a long terminal sterile flagellum; axis and bracts armed throughout with reflexed, solitary or grouped black spines; bracts tightly sheathing, up to 70 cm. long with an expanded, somewhat papyraceous limb ± 5 cm. long; partial inflorescences to 40 cm. long, with up to 15 or more rachillae on each side, subtended by bracts ± 2 cm. long (1 cm. exposed), with mouths ± 7 mm. wide and with a short triangular limb to 4 mm. ; rachillae up to 7 cm. long, usually arcuate, arranged distichously; bracts distichous, closely approximate, dull brown in colour, somewhat ciliate-hairy around the mouth. Sterile ♂ flower very similar to fertile ♂ but slightly shorter and narrower. Male flowers solitary, distichous, with minute involucre to 1 mm. long; calyx 4 mm. long, tubular for 3/4 of its length, with 3 short, triangular, striate lobes; corolla-lobes to 7 mm. long by 2 mm. wide, joined at the base for ± 1 mm., widely diverging at anthesis; stamens to 4 mm. long, minutely epipetalous, with filaments to 3 mm. long, anthers ± 3 mm. long, medifixed; pollen yellow. Female flower with calyx tubular at first and then splitting as the ovary increases in size, lobes ± 3 mm. long; corolla-lobes ± 5 × 2 mm., with 6 minutely epipetalous flattened staminodes; ovary ± 5 mm. long by 2.5 mm. wide, tipped by 3 stigmas ± 1 mm. long, markedly recurved at anthesis. Sterile ♂ flower very similar to fertile ♂ but slightly shorter and narrower. Male flowers solitary, distichous, with minute involucre to 1 mm. long; calyx 4 mm. long, tubular for 3/4 of its length, with 3 short, triangular, striate lobes; corolla-lobes to 7 mm. long by 2 mm. wide, joined at the base for ± 1 mm., widely diverging at anthesis; stamens to 4 mm. long, minutely epipetalous, with filaments to 3 mm. long, anthers ± 3 mm. long, medifixed; pollen yellow. Female flower with calyx tubular at first and then splitting as the ovary increases in size, lobes ± 3 mm. long; corolla-lobes ± 5 × 2 mm., with 6 minutely epipetalous flattened staminodes; ovary ± 5 mm. long by 2.5 mm. wide, tipped by 3 stigmas ± 1 mm. long, markedly recurved at anthesis. Fruit to 1.5 cm., by 1 cm. with a short beak to 2 mm. tipped by the stylar remains, with (15–17–18(–20) vertical rows of dull, pale brown scales, edged with darker brown. Seed somewhat flattened laterally, ± 9 × 8 × 5 mm., with sarcotesta ± 1 mm. thick when dry, somewhat grooved, with homogeneous endosperm and basal embryo. 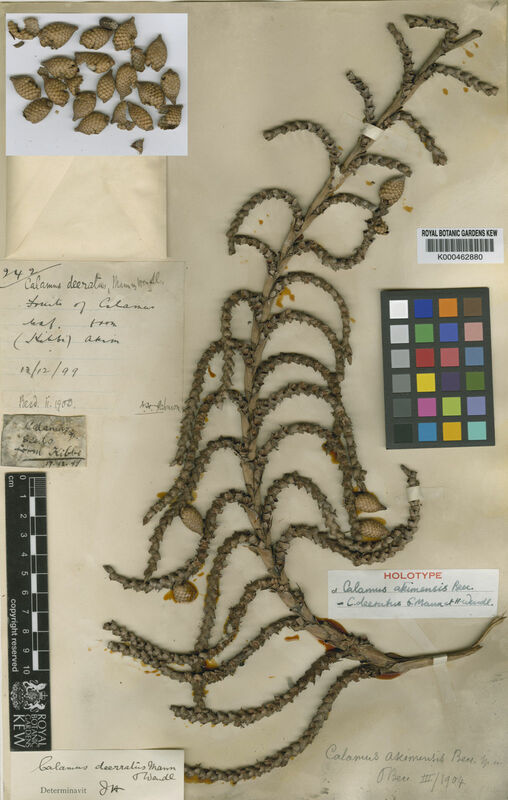 Calamus deërratus has a strong preference for swamp and riverine forest, (Ainslie 1926, Foggie 1941, Ahn 1961) and is rather less common in areas with high rainfall (Hall & Swaine 1981). As such, this species is relatively rare in the Guineo-Congolian forest of Cameroon and Gabon (Richards 1963, Letouzey 1978, Sunderland 2007). This species is more common in drier gallery forest found in the transition zones between Sudanian savanna woodland to the north of the Guineo-Congolian forest formation, and Zambezian savanna woodland to the south. 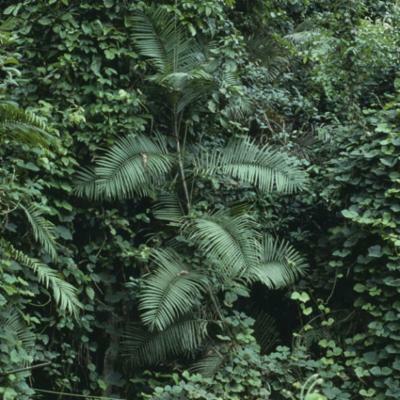 C. deërratus occurs in lowland forest areas in west and central Africa at altitudes <500m and in the higher altitude regions of east Africa >1500m. This species is usually found in forest under a canopy, but also occurs in open areas where it often forms dense thickets. Calamus deërratus is the most widely distributed of the rattans of Africa and is distributed across the humid forest zone of Africa; from the Gambia and Casamance in Senegal, southwards to northern Angola and Zambia and eastwards to southern Sudan and Uganda. The male and fruiting spadices being borne on different plants. Sunderland, T.C.H. (2012). 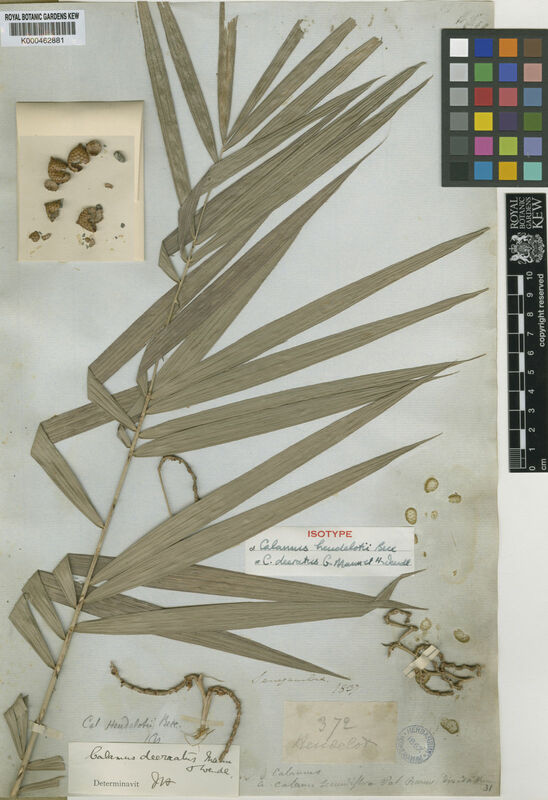 A taxonomic revision of the rattans of Africa (Arecaceae: Calamoideae) Phytotaxa 51: 1-76. T.A. Russell in Flora of West Tropical Africa, ed. 2, 3: 166 (1968). F. W. Andr., The Flowering Plants of the Sudan 3: 302 (1956). Becc. in Ann. Roy. Bot. Gard. Calc. 11 (1): 151 (1908). C.H. Wright in Flora of Tropical Africa 8: 108 (1901). G. Mann & H. Wendl. in Trans. Linn. Soc. 24: 429, t. 41 (1864).